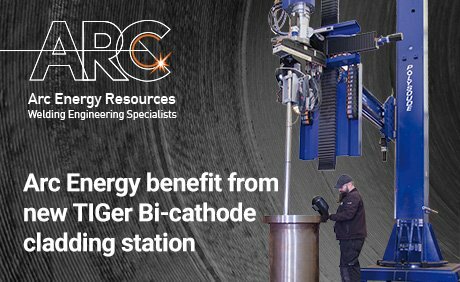 Arc Energy is now the proud owner of a weld overlay cladding station with the advantage of state of the art bi-cathode technology. The advanced technology, developed by leading welding experts Polysoude, allows Arc Energy to increase their productivity and efficiency, as well as maintain the high quality craftsmanship expected from their many clients. Many experts in the oil and gas industry agree that in the coming years the combined need for mechanical resistance and corrosion resistance will lead to zero defects. Regarding the TIG process, ‘zero defects’ is normal, but recently the issues of productivity and efficiency have been apparent. The development of the TIGer bi-cathode technology has allowed for considerable improvements in the cladding process. The juxtaposition of the two arcs and the optimisation of the layer of thickness leads to welding speeds three times faster than the conventional TIG Hot Wire technology, and can result in vastly improved services for Arc Energy’s clients. These advantages do not reduce the quality, with bi-cathode technology matching the quality obtained by conventional TIG welding. A project that Arc Energy had secured was the catalyst for the company to make the half a million Euro investment in the equipment. The cladding of the inside of 30 inch NB globe valve bodies with Alloy 625, each weighing 24 tonnes, was successfully completed for a long term client. “The process certainly will be much more widely used by Arc Energy. We see it as game changing.